Visual: Animated satellite composite for Friday morning, 25 January 2019. The brutal power of the South Atlantic high was vividly demonstrated this week. While the 1016 MB isobar (by definition the high’s outer rim) stayed offshore, its impact reached very high, close to 6000 metres above sea level, and extended deep into the continent, as can readily be seen in the visual. This produced so-called ridging which is high pressure control of the atmosphere, leading to sinking air, suppressed convection, and diabatic compression every afternoon causing excessive heat. This was evident every single day this week. Cutting through this mass of air was a classic horizontal inversion layer. This was a layer of air, originating from the tropics, with a very specific density and moisture content. It penetrates the high pressure column at exactly that level where the air densities converge. When the South Atlantic high is slightly weaker, or further offshore, this level is usually at around 12,000 feet but as the high’s influence grows (the 500 mB surface move upwards), the cloud base also rises. At the beginning of the week there was still some hope that the inversion layer, witnessed by ample cloud formation, would be able to produce some localised precipitation. These conditions however deteriorated and by the end of the week, the cloud base was up at 18,000 feet again. This leads to the rather disconcerting situation that there are lots of clouds visible, but they are relatively high, and their tops are suppressed meaning zero or very little convection. These clouds are easy to identify. They look like a wide, flat, white blanket spread over the sky instead of the more regular summer pattern of large, loose, white cumulonimbus clouds with a cauliflower appearance, reaching aloft to 45,000 feet. 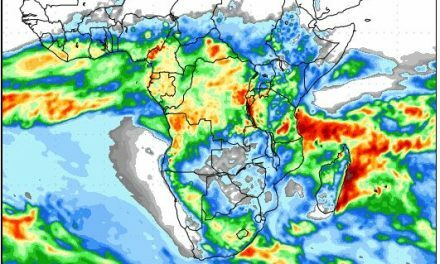 As can be expected, despite good cloud build-up over the northern and eastern parts, overall rainfall was dismal, even in the Kavango and Caprivi. During the weekend, the South Atlantic high migrates around the continent bringing a slight change in conditions as of next week, but overall rainfall prospects remain dim. The signature mid-level trough starts developing by Monday but whether it will become more than just another inversion layer remains to be seen. High pressure control stays dominant. The trough starts in southern Angola, cuts across Namibia into southern Botswana and the South African interior. It is the conveyor of moisture and will again produce widespread cloud but the expectation for next week is less (or weaker) upper level ridging, so convection may be enhanced, but this is not a certainty. Still, the trough impacts mostly the eastern half of Namibia, effectively splitting the country in two zones. Clouds should form more or less up to the escarpment and can develop into thunder showers almost anywhere. All in all, conditions are not positive for a full onset of the rain season, and the Kaiser may just consider moving his birthday celebration on by a week or two.